We are excited to serve you and other regional professionals! 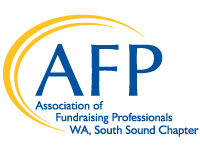 In an effort to "advance philanthropy and inspire excellence in the fundraising profession," the South Sound Chapter of the Association of Fundraising Professionals (AFPSS) offers members the opportunity to learn, network and connect with colleagues, and enjoy resources that will help you grow in your work and career. Join us for a program or event to check out our community, or join as a member and start leveraging your benefits right away. We look forward to getting to know you! AFP South Sound members James M. Hushagen, J.D. and Emily Happy, Principals, The Philanthropy Collective, share recommendations and a sample policy for nonprofit board fundraising. Learn why 2019 AFPSS president Kate Albert Ward said "yes" to AFP and has continued to stay involved.